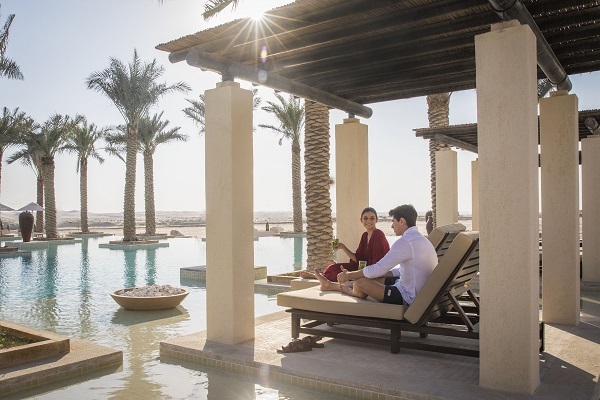 Jumeirah Group has expanded its portfolio in Abu Dhabi with a luxury desert resort: Jumeirah Al Wathbah Desert Resort & Spa. The resort draws inspiration from a historic desert village, and features courtyards and walkways, along with water features and pools inspired by the natural falaj (water channel for irrigation). The Arabian-style property sprawls over 22,000m2 of desert and comprises a spa, villas with private pools, Arabian-style rooms, a 1,000m2 pool, and six restaurants and bars. Adventure seekers can enjoy fat-biking through the dunes, desert treks, falcon shows every evening, archery and destination dining experiences. The resort’s pool stretches out into the desert and expands into inlets and coves, including a pool bar with in-water seating. The destination Talise Spa offers 13 luxury treatment rooms and private terraces, along with Turkish hammams, snow caves, hot and cold plunge pools and crystal salt and cryo therapy rooms. There is also a dedicated yoga platform. The cuisine is inspired by Arabian flavours, rustic Italy and the Mediterranean. Poolside dining can be enjoyed at Panache, while remote desert camp Al Mabeet has been inspired by Bedouin traditions and offers a traditional desert dining experience. A rooftop bar is also on the premises. Additional amenities include a kids’ club, conference and meeting facilities. The property is located 40 minutes from Abu Dhabi downtown and 90 minutes from Burj Al Arab, while the Sheikh Zayed Grand Mosque is 30 minutes away.